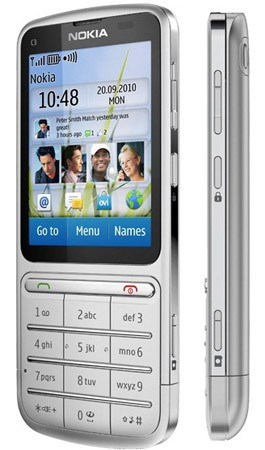 At the Nokia World 2010 Event in London, Nokia has announced yet another touch screen mobile phone Nokia C3. The design of this phone is highly inspired from the already available devices such as Nokia 6700 and Nokia 6300 phones. As the name suggests, the new Nokia C3 supports both the touchscreen and normal keypad. The users can enjoy the modern touchpad as well as the normal keypad. The Series 40 device promises best-in-class communications, with Quad band phone calling, and both 3G/HSPA and WiFi internet connectivity. It comes with Nokia messaging 3.0, the latest incarnation of Nokia’s email, instant messaging and the Communities client offering Facebook and Twitter access. The device also allows users access to games and other applications through the Ovi Store. The new C3 offers a high-quality build for your money, with a 100% stainless steel case and a 5-megapixel camera with flash on board. It will come in Silver, Warm grey and Khaki Gold colour variations. It measures 111 x 47.5 x 11mm, with the screen measuring 2.4-inches, diagonally. The device supports MicroSD memory cards for storage up to 32MB. One of the best from s40 series. Nowadays it’s really confusing to choose a best phone due to large options available. Yap due to various models and qualities it quite difficult to choose. I like its Grey color..
best thing i like in phones is camera… and 5 mega pixel with touchscreen in such a low price.. must look forward for this model…. While i think the successor to C3 is equally awesome and since its just the second touch and type phone on S40 series, i would like to think, there will be a lot of advancement for this range of phones. Well, I look forward to this phone… I am still wondering, when are those coming on sale or are them already ?? On websites it is coming soon, but maybe it is coming really late ?? It is not the most expensive one, but it is good. That videocalls and GPS are two things not good about it, but it seems like Nokia’s one of the greatest phones coming out now or something. please tell me when nokia c3 touch & type phone will be available in srinagar. HOPE THEY WILL ADD IN NEXT EDITION !!!!!!!!!!!! please tell me when nokia c3 touch & type phone will be available in punjab. This phone is very good phone like Touch, 3g,Wifi and 5 mp camera with Flash touch and type i think this is the best phone of nokia in this range. this c3 touch and type have gtalk . and yaho msgr opt??? ?